There is only one moment during the day watch collectors would rather avoid the sight of their watch. The dreaded wake up call our alarm clock gives us every morning. Against all odds, Hublot has been able to make that moment a little sweeter with the introduction of the Hublot Big Bang Alarm Repeater. As its name suggest, the alarm repeater integrates one of the oldest complication, an alarm clock, inside a wristwatch that chimes the hour and minutes to wake up its owner in the morning. 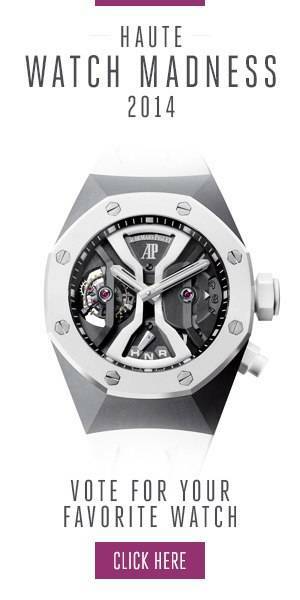 The Hublot Big Bang Alarm Repeater is the brand’s third and most recent chiming watch after last year’s award-winning Classic Fusion Cathedral Tourbillon Minute Repeater. Named the best “Striking” watch during the 2014 Grand Prix d’Horlogerie de Genève, the titanium minute repeater brilliantly showcased the brand’s ability to strike the right balance between a traditional chime and modern materials. The Big Bang Alarm Repeater, which fuses a mechanical alarm clock with a second time zone indicator is evidence of the brand’s maturity, and highlights how far the young manufacture has progressed since it was inaugurated in 2009. The programmed alarm time is shown through a 24-hour counter with two hands at 5 o’clock, while an “on-off” indicator is visible at 6 o’clock. When it rings, the alarm clock chimes for around 16 seconds as a steel hammer – coated with SuperLuminova™ – strikes a gong, meaning you’ll be able to hear, and see the time, even if you wake up before dawn. The watch also features a second time zone, displayed at 11 o’clock and adjusted via a push-button at 2 o’clock, as well as a day and night indicator inside triangular window at 1 o’clock. The caliber comprises 356 components, a 72-hour power reserve and two barrels – one for the movement, the other for the chime. The alarm clock’s power reserve indicator can be consulted via its skeleton barrel that reveals the spring. The Hublot Big Bang Alarm Repeater is available in titanium or King Gold, priced at $66,700 and $85,100 respectively. Each is limited to 250 pieces and comes with an interchangeable rubber strap featuring the brand’s ingenious “One click” system.